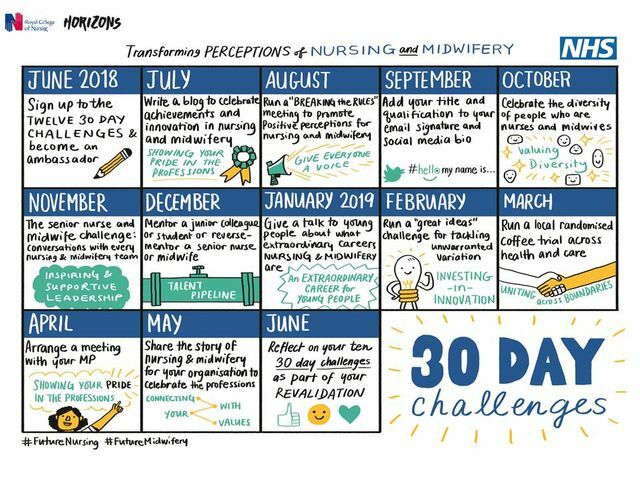 Are you ready for the Transforming Perceptions of Nursing and Midwifery 30 Day Challenges? Sign up today! Would you like to be involved in helping transform the perceptions of nursing and midwifery? Sign up for the 30 Day Challenges! 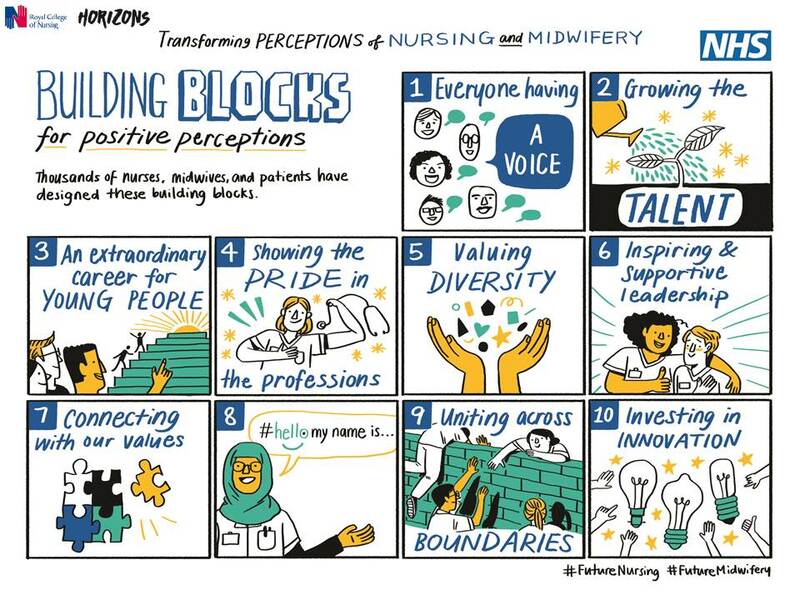 The topic for each monthly challenge derives from the themes in the 10 Building Blocks (picture below) that were designed by thousands of nurses, midwives and patients through ideas submitted to our crowdsourcing site. The 12 monthly challenges are all about people working together to help put these building blocks into action. 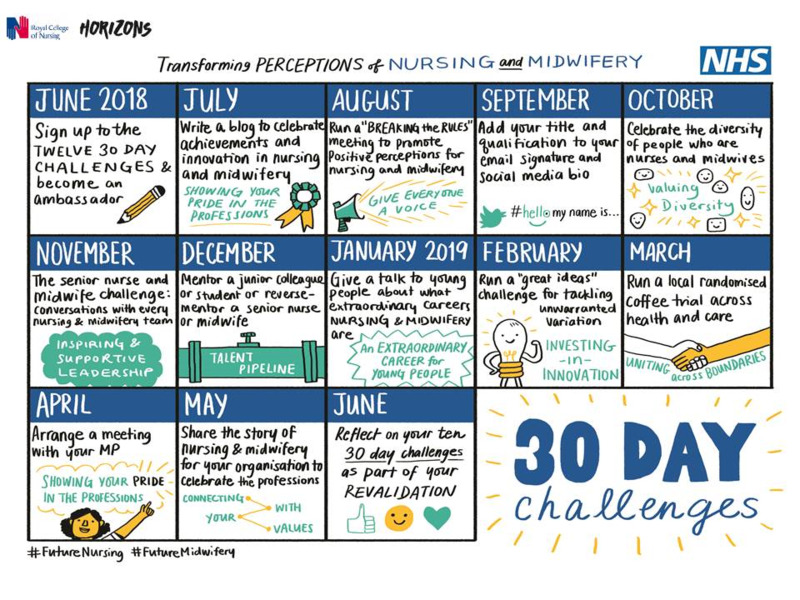 By signing up to the 30 Day Challenges, you will receive support and encouragement from the Perceptions team, as well as the opportunity to build community and share ideas with nurses and midwives at other trusts throughout the country. We will be sharing more details about each individual challenge, including tips and ideas at the beginning of the preceding month. You are of course very welcome to start work on any of the challenges before and and continue work beyond a particular month - we have structured the challenges this way in order to offer a focus, support and build energy within the community each month. The opportunities offered by the challenges aren't limited to our nursing and midwifery colleagues: many of them will benefit from the support of a range of departments, such as communications, HR, learning and development for example. It's a good idea to get in touch with these departments to look at how you might be able to work together on the challenges. If you're not a nurse or midwife and would like to get involved, why not make contact with colleagues in these specialties to offer your support - I am sure they would love to hear from you! The opportunities offered by a career in nursing and midwifery have never been better, with roles ranging from the essential day-to-day caring responsibilities – to the highly technical, research, executive leadership – and many, many more. Through this campaign, we want young people to know about the exciting breadth of careers available; we want teachers to promote nursing and midwifery as career of choice, we want nurses and midwives to reignite their pride in the professions, and we want system leaders and decision makers to make sure nursing and midwifery expertise is at the heart of shaping future healthcare policy.